One of the most frequent questions I receive from those who read this blog (whether piano teachers or students), is how to prepare for diploma exams and how to select an interesting, innovative programme. My blog post today seeks to answer the latter question. There is no ‘correct’ answer of course, as programming is a very personal choice; it can be a lengthy process, and one which is totally dependent on a candidate’s ability (elements such as a pupil’s current technical control, musicianship and their commitment, must all be considered). I have several students preparing to take their diploma exams over the coming months. Diplomas are for those who have taken Grade 8 (the final amateur piano exam of the majority of exam boards here in the UK, and many worldwide), and are moving on to more advanced repertoire; professional qualifications are attained for those who are successful. In my opinion, the performing diplomas such as the DipABRSM (it’s possible to take piano teaching diplomas too) serve as ideal preparation for those wishing to attend music college or study music at university. My pupils have decided to take the ATCL (exam board: Trinity College) followed by the DipABRSM (exam board: ABRSM) a term later. These particular tests represent the first level of diplomas (the higher exams being the LTCL and LRSM, followed by the FTCL and FRSM). A diploma programme can take anything from a few weeks to a couple of years to prepare. Therefore an important criteria is to choose works which you not only love, but ones which you are happy to live with for a long time. Occasionally, pupils will learn pieces, leave them and return to them at a later date, but generally once learnt, they are keen to take the test as swiftly as possible. Diplomas demand a completely different approach to that of Grade 8; where selecting three pieces is fairly straight forward, and programme choices are limited and already ‘well-balanced’ in the sense that works have been carefully categorised. Pupils taking diplomas are confronted with a huge list of repertoire, (you don’t always have to stick to the suggested repertoire list, it is possible to make personal additions which must be agreed in writing by the exam board before the exam). Prior knowledge of styles, genres and composers is essential, and this is where a helpful teacher will be able to direct students and assist in making decisions. Important decisions; choosing the wrong pieces or programme could be the difference between success and failure. The ATCL and DipABRSM require recitals lasting just over 30 minutes, and this is really the only guideline regarding programming, everything else is left to the candidate. So how do you start to make sense of vast lists of piano pieces? Listen widely. Not just to the selected piano works, but to a large range of music, in order to assimilate styles and genres; the more you know about styles and periods, the easier it is to decide which you would prefer to tackle. YouTube is your friend (although aim to select ‘professional’ performances wherever possible), however, it’s helpful to just ‘log on’ and listen. Programmes must be ‘well-balanced’, which means works should not ideally hail from the same period, although it’s possible to select several pieces from similar historical eras, as long as stylistically they are quite different. It’s not essential to represent every genre or style. Decide whether you prefer to select a group of shorter pieces, or one longer work with a few smaller additions. Once you have elected a few appealing composers (appealing to you! ), listen to all the offered options on the list written by those composers; for well-known composers such as Mozart and Beethoven, there will be many pieces from which to choose. When selecting, imagine playing the piece and ask yourself the following questions: Can I really manage those intricate passages under pressure? Will I be able to play it up to speed? Is it a style I am familiar with, or will I need to become acquainted with it? Does it move or affect me emotionally? The last question is undoubtedly the most important. It can be a good plan to immediately delete works which are too challenging, gradually reducing the size of the list. If four works are chosen, how will they be programmed? You don’t have to play them in chronological order. You should endeavour to present them in an order with which you feel comfortable. It can be interesting starting with a Contemporary work, for example. Before learning begins, do your research and find out as much as you can about your chosen composers; you will probably need this information for the Viva Voce (question and answer session which takes place after your recital) anyway. Dates of birth, style, genre, amount and type of piano repertoire, and for which instrument(s) the works were originally written (if applicable), should all be very familiar to you. Know why you have selected your pieces. This will help clarify the selection process. Speak to your teacher (if you have one) at length and maybe seek other opinions and ideas from music professionals. It can be enlightening to hear what others say, in order to devise a well-rounded recital. The last tip is, for me, the most important. Never select works which reveal your shortcomings (everybody has them). A diploma is not the place to learn technique; this must be done in private on suitable studies or other repertoire. In the next post about diplomas, I will suggest a few composers and general repertoire proposals which might be beneficial for those who feel less than confident about preparing for these exams. ‘Who developed the concept of playing from memory?’ This question is pursued on the lips of many piano pupils, conservatoire students, and professionals. Memorising a work (playing without the score or committing a work to your memory) certainly puts an extra strain on an artist. Every note must be meticulously rehearsed and learned to the point of distraction (or might I suggest obsession in some cases). Whilst a small number pianists find memorising a piano piece a relatively easy task, others struggle and live in fear of the errant memory lapse on stage. So who do we have to thank for this sometimes gargantuan task? The piano came into its own in the middle of the 19th century during the Romantic era; before this period, pianists would have been lucky to appear briefly in a concert and they certainly would not have played from memory. 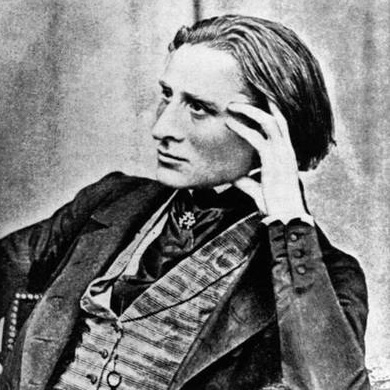 A pianist then came along who changed all that forever; Hungarian pianist and composer, Franz Liszt (1811-1886). Liszt (pictured above) single handedly developed the concept of the solo recital (his word too). Before Liszt it was unthinkable to have a whole evening concert featuring one artist playing just one instrument. Liszt recognised the power of the virtuoso not just by the idea of a pianist playing incredibly complex and flashy pieces that run all around the keyboard (although this can be impressive), but also the importance of image and crucially stage presence and charisma. He cultivated almost rock star status and was pursued and idolized everywhere he went. This was partly down to the way he approached performing (as well as his beautiful piano playing and his good looks!). ‘Look up and away from the keys, and you will play with greater inspiration. Neglect of this is the cause of much of the crippled playing one hears’. Liszt benefitted tremendously from performing in this way and successfully conveyed the romantic image he worked so hard to cultivate. However, for those mere mortals who have since made the concert platform their home over subsequent generations, playing from memory has indeed been the cause of much misery. Today a concert pianist cannot be taken seriously unless he or she plays everything without the score and many students are frequently perplexed as to how to sucessfully memorise pieces. Those taking amateur music exams are not required to play from memory but if you are preparing for a school concert or music festival it’s a good idea to be brave and perform without the music as it tends to give a more polished performance and shows you really ‘know’ your piece. 1. If you know you are going to commit the piece to memory then start memorising from the outset. As you learn the note patterns and fingerings make sure your fingers and brain are memorising carefully as you progess line by line (or bar by bar). 2. Look out for obvious signs in the music that will ‘jog’ your memory; key changes, chordal progressions, scalic passages, large leaps etc. All these elements will aid memorisation. They will act as sign posts. 3. It’s best not to rely solely on digital memory (i.e through the fingers) alone. This is one way to come unstuck during performance. A better idea is to have a thorough knowledge of the work’s structure particularly the harmonic structure. Study it methodically and intellectually even before you start memorising. 4. You will benefit from knowing the piece aurally, digitally and mentally before you work on the interpretation. One tip I always find useful when memorising is to concentrate on the interpretation and on ‘hearing’ the music in my mind, epecially focusing on the way it affects me emotionally. By doing it this way you will never forget anything. Under pressure, our memory sometimes lets us down so do make sure you have many practice performances without the score before your ‘big’ concert. Good luck and happy memorising! I was recently asked to name some late 20th and 21st century piano pieces suitable to play for diploma exams (some boards such as Trinity allow candidates to submit own choice pieces). On examining the diploma syllabus I was struck by how little contemporary music was included – and by contemporary I mean music of today. I am not talking about composers such as Charles Ives, John Cage, and Stockhausen, because whilst they are all great, they are not viewed as cutting edge anymore. I then realised how little contemporary piano music I knew! I was horrified as I do really enjoy listening to new music and I frequently review it. Contemporary music is vital if classical music is to survive and grow. So I decided to delve a little deeper and discover just what living composers have to offer in terms of piano music. I should say right here and now that this list is certainly not exhaustive – it is a work in progress. Here are my musings so far……. Harrison Birtwistle (1934 -) is a British composer and his music is complex, written in a modernistic manner with a clear, distinctive voice. Piano works include: Harrison’s Clocks (1997-8), Ostinato with Melody (2000), and Saraband (2001). Arvo Pärt (1935 -) is an Estonian composer. He works in a minimalist style that employs his own self-invented compositional technique, tintinnabuli. His music also takes inspiration from Gregorian chant. I find his music moving and strangely beautiful. Here are a few piano pieces to look out for: Fur Alina (1976) and For Anna Maria (2006). Steve Reich (1936 – ) is an American composer who was one of the pioneering composers of minimal music. Reich’s style of composition influenced many other composers and musical groups. He has been described, in The Guardian, as one of “a handful of living composers who can legitimately claim to have altered the direction of musical history”. Reich has written a lot of music for multiple pianos (notably recorded by the wonderful Piano Circus) but his work Piano Phase (for two pianos) has been performed and recorded on one piano. John Tavener (1944 – 2013) is a British composer known for his religious, minimalist choral music. Taverner was influenced by Messiaen and Arvo Pärt (amongst others) and this is immediately obvious on hearing his works – there is a real spiritual quality present in his sound. Here are some piano pieces: Palin (1977), Ypakoe II (1997), Mandoodles (1982) and In Memory of Two Cats (1986). John Zorn (1953 -) is an American composer who draws upon his long experience in classical, jazz, rock, punk, and klezmer music. A leader of the “downtown” music scene centered around the Lower East Side of New York City, Zorn feels most connected to the tradition of the avant garde . Piano works include the highly innovative Carny (1989). David Lang (1957-) is an American composer and his music is described as post-minimalist or totalist. He recently ran a piano competition featuring the performance of one of his works via YouTube offering the winner a chance to go to New York to perform it. Here are a few of his piano works: Boy (2001), Broken Door (1997), Memory Pieces (1992-1997) and Wed (1992-1997). Oliver Knussen (1952 -) is British and is one of the most respected composers of his generation. I love his brittle, yet expressive style. His piano pieces are really worth exploring: Sonya’s Lullaby (1978), Variations for Piano (1989), Prayer’s Bell Sketch (1997) and Ophelia’s Last Dance (2010). James MacMillan (1959 -) is a British composer whose music is infused with the spiritual and the political. He has written a whole myriad of piano works: Angel (1993), Birthday Present (1997), A cecilian Variation for JFK (1991), Piano Sonata (1985) and Walfrid, on his Arrival at the Gates of Paradise (2008). Julian Anderson (1967 – ) is a highly respected British composer whose music is influenced by the folk music of Lithuanian, Polish and Romanian traditions–and also by the modality of Indian ragas. Piano works include the Piano Etudes Nos. 1-3 (1998). Roxanna Panufnik (1968 -) is a British composer and is the daughter of composer and conductor Sir Andrzej Panufnik. She has written a wide range of pieces including opera, ballet, music theatre, choral works, chamber compositions and music for film and television which are regularly performed all over the world. Piano Piece: Second Home (2003). Thomas Adès (1971- ) is a British composer. His complex yet appealing music exhibits a flair for drama, humor, and personal expression, and is notable for the creative use of instrumental color. He has written many piano works including: Still Sorrowing (1991-2), Traced Overhead (1995-6), Under Hamelin Hill (1992), and Darknesse Visible (1992). Tansy Davies (1973 -) is a British composer. Her music is informed by the worlds of the classical avant-garde, funk and experimental rock. Piano work: Loopholes and Lynchpins (2001). Emily Hall (1978 -) is a British composer known for writing classical music, electronica and songs. Heavily influenced by folk music, Emily’s piano piece, No Currency was written in 2006. Charlotte Bray (1982 -) is another British composer. She judged the 2012 Young Musician of the Year Competition. and has been described as an ‘outstanding talent’. She has won numerous prizes for her work. Her piano piece off the rails was written in 2005. I realise that I have only merely scratched the surface here – and it’s been most enlightening. I will be returning to this vast topic soon. Meanwhile if you have any other suggestions of either piano works or composers to add to this list then please let me know.